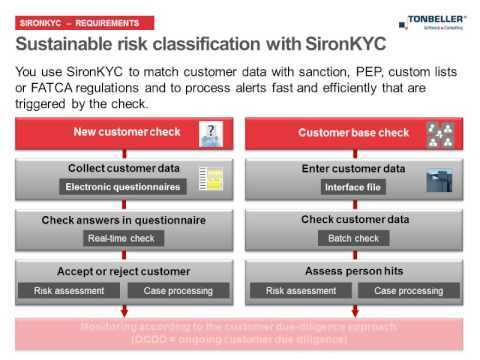 TONBELLER helps insurance companies through all anti-money laundering aspects and stages with an integrated solution, whose components can also be employed as stand-alone applications. The solutions follow the risk-based approach and facilitates the identification, categorization, and description of money-laundering risks. Based on derived prevention measures, the configured research and monitoring system filters relevant money-laundering issues through analysis of the combined partner, contract, and payment data. Due diligence corresponds to the customer's risk class. Customer data is continually matched with sanction, PEP, and other lists. Alerts are edited in Case Management. Payments from or to sanctioned persons, organizations, or persons on the watch list are stopped and revised. Integrated cockpits allow the company's management to control money-laundering. There are currently no reviews of Tonbeller. Below are some frequently asked questions for Tonbeller. Q. What type of pricing plans does Tonbeller offer? Q. Who are the typical users of Tonbeller? Q. What languages does Tonbeller support? Q. Does Tonbeller support mobile devices? Q. Does Tonbeller offer an API? No, Tonbeller does not have an API available. Q. What other apps does Tonbeller integrate with? Q. What level of support does Tonbeller offer? Q. Which apps is Tonbeller compared to most often?